Cygnus X-1 is a binary star system that contains a black hole. The Cygnus X-1 system looks like a single star in this image. 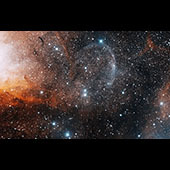 It is the brighter (bottom) of the two stars near the center of the image. Gas from the companion star is being pulled into the black hole. Before it falls in the gas becomes incredibly hot, so hot that it emits X-rays (which is how it was discovered). Some of that gas doesn't fall into the black hole but instead is shot out as 'jets' of hot gas. The jet itself isn't visible in this image but you can see the bowshock, the bluish umbrella-like shape at the top center of the image, that is produced when gas in the jet collides with other gas in the nebula. 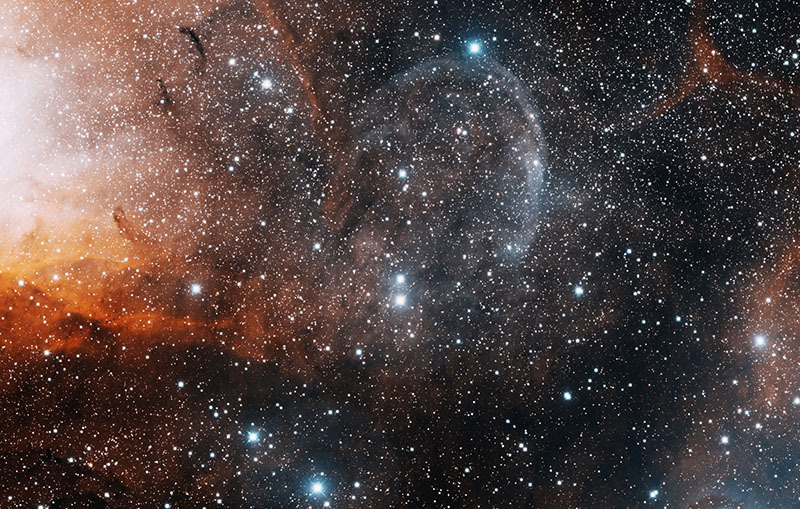 The bright orange gas to the left is the western edge of an emission nebula called Sharpless 101 (Sh2-101).